Expand your horizons! Studying abroad for a period of time is an experience from which you will benefit throughout all of your life. Get to know another system of studying and other cultures, while improving your foreign language skills and meeting fellow students from all over the world. Welcome to Innsbruck! 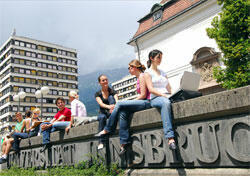 The University of Innsbruck is very popular with students from all over the world. Thus, 40% of students and teachers come from abroad. The quality of study programmes, as well as the location in the beautiful natural heart of the Alps and Europe, contribute to its popularity. The entire range of studies, programmes and courses offered by the University of Innsbruck in English.